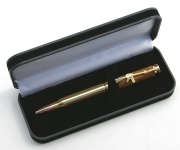 DELUXE pen presentation box suitable for 2 items; pen & pencil, pen & letter opener, pen & magnifier, etc. Excellent for a woodturner to present handmade gifts. The box is plastic, covered in black velvet with a spring loaded lid. Inside is lined in white satin and black velvet with a single strap, dimensions 160x60x20mm. Pen not included.